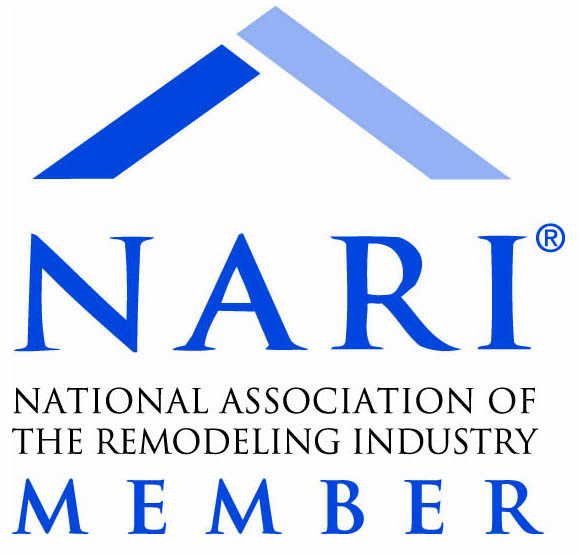 Having a master bathroom that is not functional can be a pain. 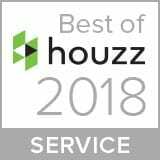 Whether you suffer from not enough storage space, or failing cabinetry or showers, or even from just not having enough room for more than one person, it can be an annoyance. 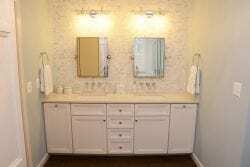 A local family wanted to do something about their master bath, and they were ready to make a change. Working out of the Cabinet Discounters Olney showroom, the customers met with designer Claudia Gillespie. With Claudia’s guidance and expertise, they were able to come up with a plan to alleviate the pains of the master bathroom. 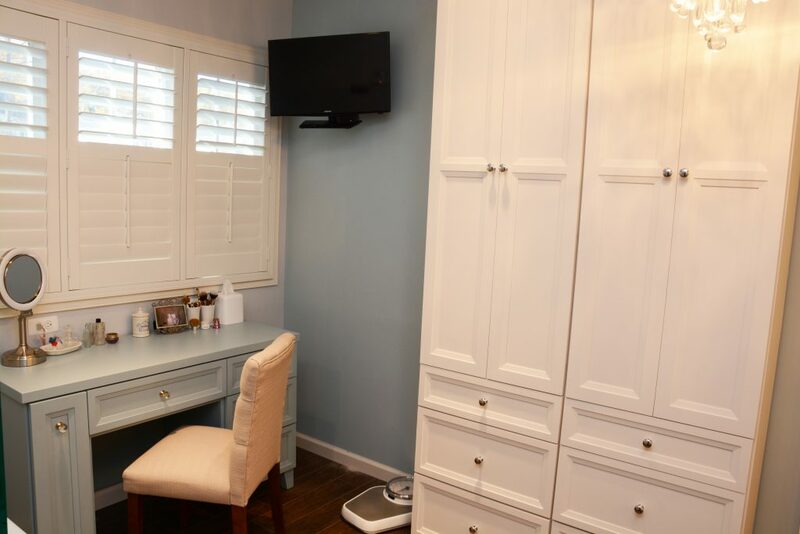 Claudia was able to give the customers a tall cabinet for storage, a seated vanity area for makeup, and a spacious vanity area around the sinks. The addition of tile on both the wall behind the sinks and the shower really give the bathroom an elegant feel. Along with Claudia, the customers selected Brighton Cabinetry for their master bathroom with Hillsbrad door style. 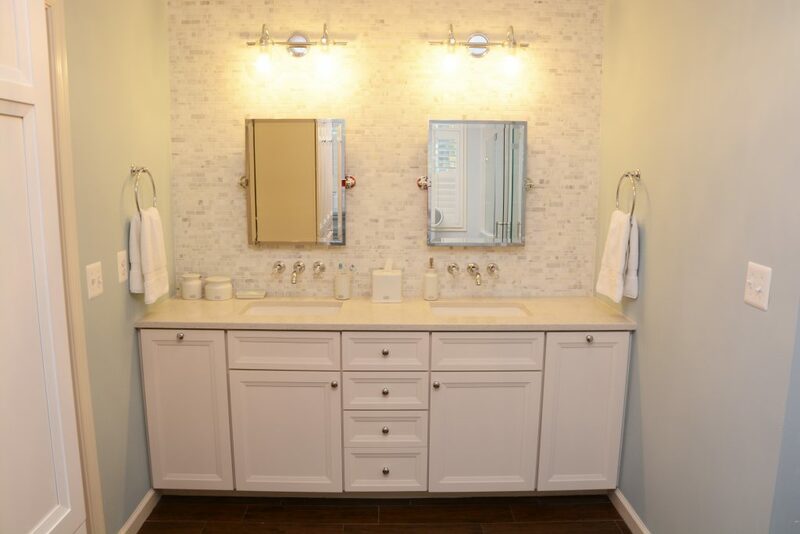 The tall cabinets and sink area are Maple Downy color and the seated vanity is Maple with a custom blue color. The countertops are Cambria Weaverton quartz. 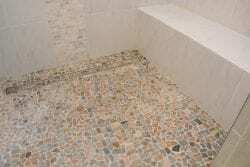 The floor tile is Berkshire Olive porcelain. The wall tile in the shower is Florida Tile Gallant Carrara 18″x18″. The wall behind the sinks and shower accent piece is Jeffrey Court Chapter 3 Streamstone Modernique, and the shower floor tile is from Bati Orient. 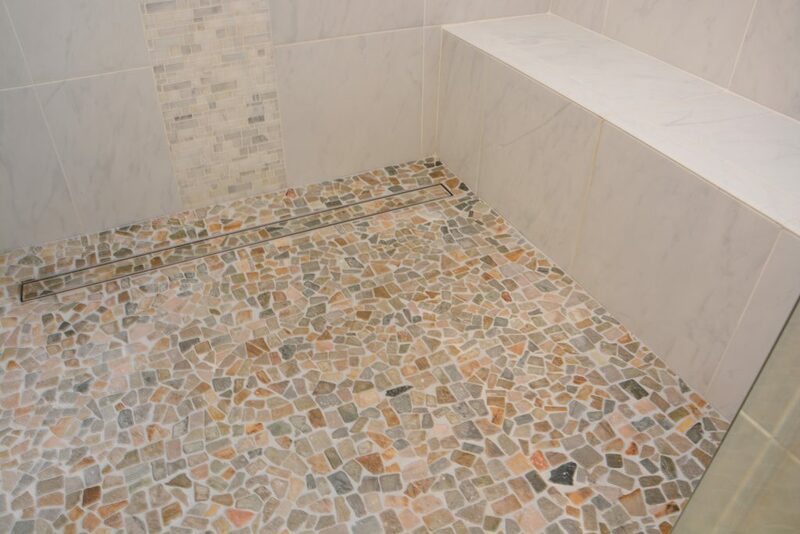 All of the materials combined create a truly gorgeous new master bathroom. 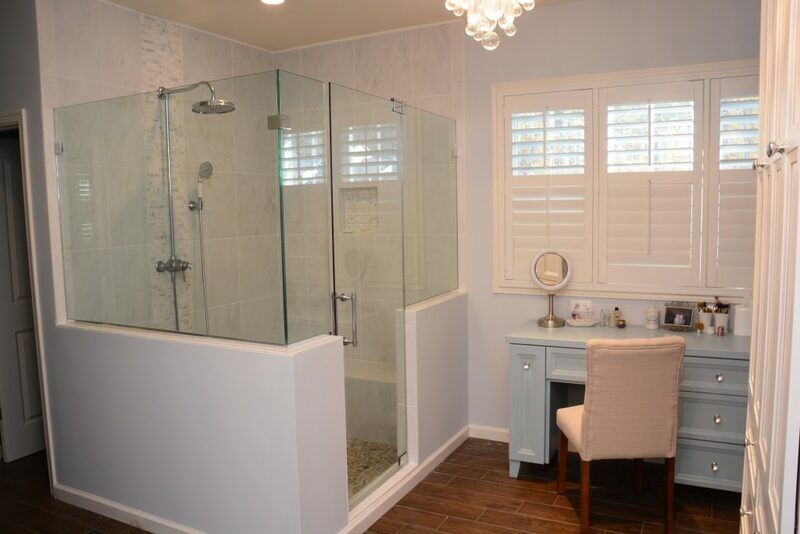 There is now plenty of storage space, plenty of space in which to get ready in the morning, and even a beautiful new shower to help you start your day off right. If you are like these customers and are in search of a new master bathroom in your home, then Cabinet Discounters is just the place for you! You can sign up today for a showroom appointment with one of our experienced designers, or you can simply stop by one of our seven convenient Baltimore-Washington area locations and start building your dream today!